For as long as I can remember, I have been a Disney fan. Growing up with an Aunt who loves all things Disney made my first trips to Walt Disney World beyond memorable, they were magical. My Dad and my Aunt visited the first year WDW opened as well and countless times after that always sharing with me the excitement of a Disney vacation. Our family vacations camping at Fort Wilderness, visiting the parks or on the beaches brought along excitement and memories to last forever. Now married with two daughters, I have been able to see the magic through their eyes. We share the same love of Disney. 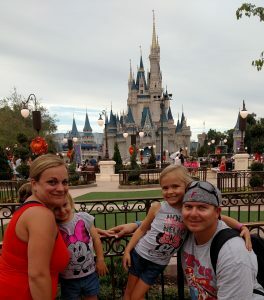 The excitement of watching Illuminations, Wishes, the Dumbo ride or having breakfast with the Princesses has made new magical memories for my family. I worked with Mouse Made Simple planning our last trip to Walt Disney World and knew immediately this was something I wanted to do. I enjoy offering suggestions to others about things to do with the kids or events the grandparents would love. Helping you plan a magical vacation for all ages is my passion. My goal is to plan an unforgettable vacation, whether it be to Disney World, Land, Adventure, Cruise, Universal or the beaches of Jamaica, that is as enjoyable and hassle free as possible. Making magical memories with loved ones is priceless!